September is one of the laziest month of esports season — nothing huge happens this month. Dota 2 rests from The International, the League of Legends community awaits Worlds, CS:GO don’t have any Major tournaments. It opens the window of opportunities to new disciplines and small tournaments. 2017 World Championship began in late September - the largest League of Legends tournament attracted a huge audience of esports fans. There were more than 36 million viewers at the online peak. It is significantly more than it was last year, and we expect even more stunning results in the group stage, the playoffs and the grand final. LPL, Chinese league, ended at the beginning of September. As you can see, one day was enough to take the confident second place in the list of the most popular broadcasts. Unexpected candidates took three positions in our top, primarly becasue of the huge Chinese audience of viewers. Overwatch Premier Series 2017 were organized only among Chinese teams, thus it became very popular in the Celestial Empire. 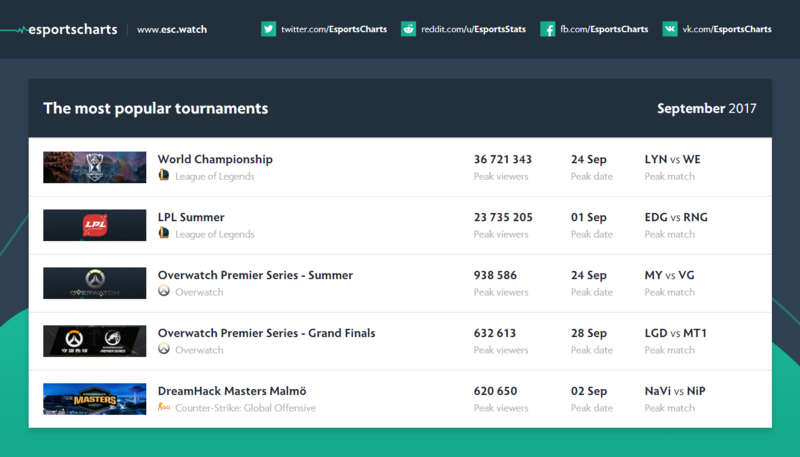 Interestingly, Overwatch Premier Series 2017 - Grand Finals was less popular than the summer championship. Grand Finals were held during the 2017 World Championship, that was the main reason of low amount of viewers. The most unexpected cherry on the cake is DreamHack Masters Malmö 2017 by CS: GO. In September, the Valve shooter successfully launched in the Chinese market with the help of Perfect World. Couples of weeks was enough to attract a huge number of Chinese to the world of Counter Strike - Chinese professional teams and tournaments on CS:GO began to appear. 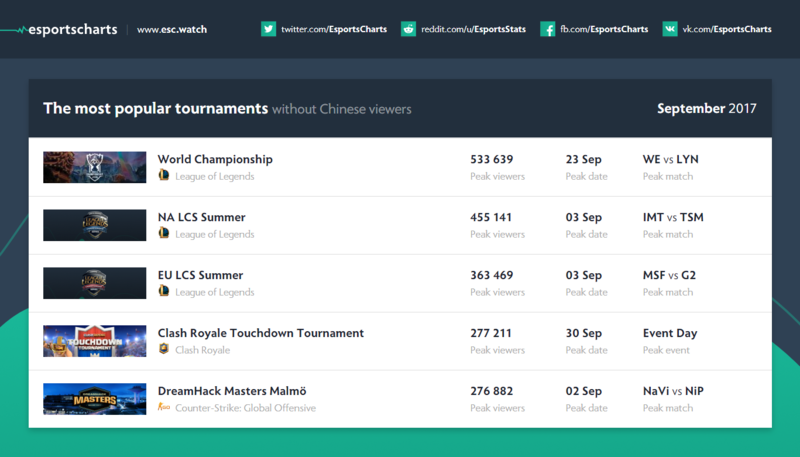 Chinese viewers are already twice as many as the western ones. We expect the impressive growth of the Chinese fanbase CS:GO in the future. The esports world without Chinese region is also huge and has unexpected nominees. 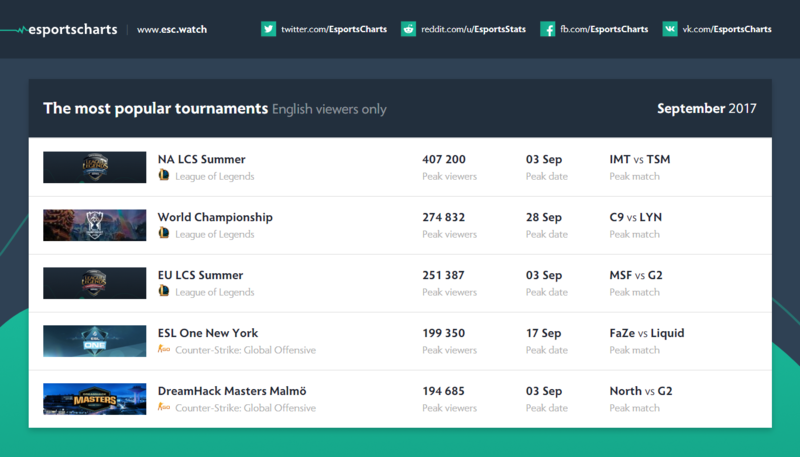 The first three positions are occupied by the 2017 World Championship and the LCS leagues. Top 5 took DreamHack Masters Malmö 2017. However, what is the Clash Royale Touchdown Tournament? Supercell, the developers of Clash Royale, released a huge update in late September, which adds a new mode to the game - Touchdown. They held a small demonstration tournament for two hours. The funny fact is that the huge part of the audience was from South America - mostly from Brazil. The English-speaking top turned out to be the most stable - there is no unusual disciplines: only League of Legends and CS:GO. However, there is an interesting fact - the North American league LCS Summer has collected more viewers than the 2017 World Championship. In October, the main tournament of the year League of Legends will definitely bring together a lot more people, especially if some western team will show good results. Russian-speaking viewers were "sleeping" the whole of September. There were no Dota 2 major tournament - only qualifications. That is why League of Legends hit the second place in the top, while being not popular in this region. 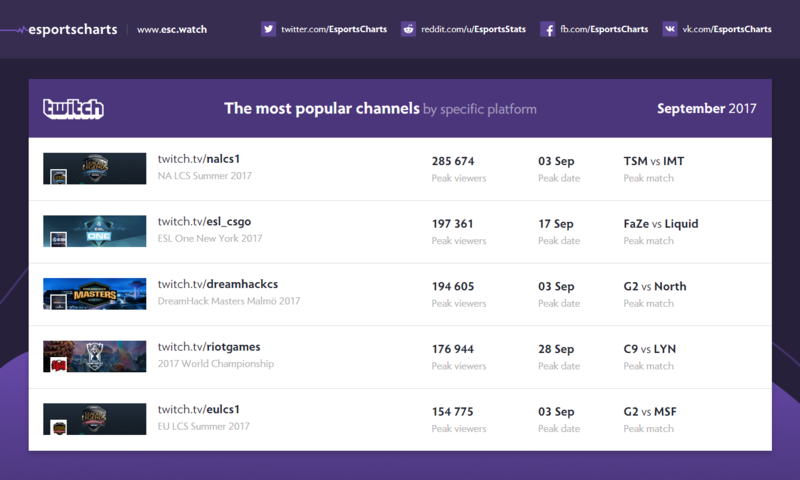 Twitch.tv statistics does not surprise - there are only major tournaments in the League of Legends and Counter Strike: Global Offensive. DreamHack Masters Malmö 2017 has overtaken the European LCS league - it is very insignificant, but revealing.